Facit Sverige 2019 is out now! 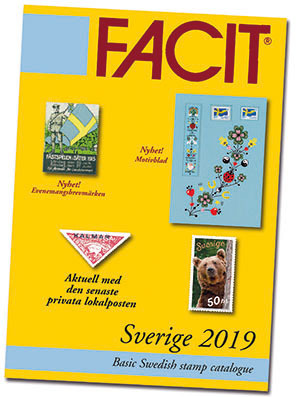 FACIT Sverige 2019 is 392 pages - the most extensive Sweden catalogue yet - and features all Swedish stamps from the beginning in 1855. All values are described with prices for unused (both hinged and never hinged) as well as cancelled stamps and with all the different stamp designs depicted in colour. The catalogue is written in Swedish (with most parts in English as well) and is very user-friendly. NEW: A list of stamps that cannot be soaked off using water. Tourist Postage Labels and Newspaper Stamps. First Day Covers, booklets and self-adhesive stamps in covers. NEW: For the first time a cataloguing and pricing of the Swedish Event Poster Stamps from 1874 through 1925 is presented. NEW: All published (549) Thematic Sheets up to 23 August 2018 are now pictured and complemented with a compiled price list. As a continuation of the images of the Official Maximum Cards in FACIT Sverige 2017, you will find the remaining ones here (MK551-MK581) along with a price list for these. MK581 is the last one issued. The Swedish private local post is updated with all the latest issues. Now also translated into English. Updated membership roster for the Swedish Stamp Dealers Association. No less than 392 pages. The price of the catalogue is SEK 350 incl. VAT (p&p will be added). Facit Norden 2019 has been released! This year's edition of FACIT Norden is now available. Order it at FACITstamps! 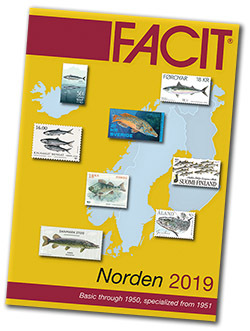 FACIT Norden 2019 is the specialized catalogue featuring all stamps of the Nordic countries in colour. The stamps from 1951 onwards are described with varieties, while the stamps from the period before 1951 are described with issue and denomination, without varieties, with the price for a normal stamp. All stamp booklets are listed with varieties, even before 1951. The catalogue is now printed on 70 grams paper, resulting in significantly improved image quality. For the first time, prices for Swedish single frankings including BB/SX on covers, postcards and printed matters after 1951 are presented. A substantial revision of Swedish self-adhesive stamps in covers (SH). For the first time, a summary of Swedish Anniversary Issues is included. Norwegian “Affixing roll stamps from 2007 until April 2018”. Summary of the Greenlandic franking machines' unique code numbers. Price adjustments and various corrections. Adverts from stamp dealers and auctioneers. Adverts from the Nordic Postal Services. No less than 960 pages. The price of the catalogue SEK 450 incl. VAT (p&p will be added). 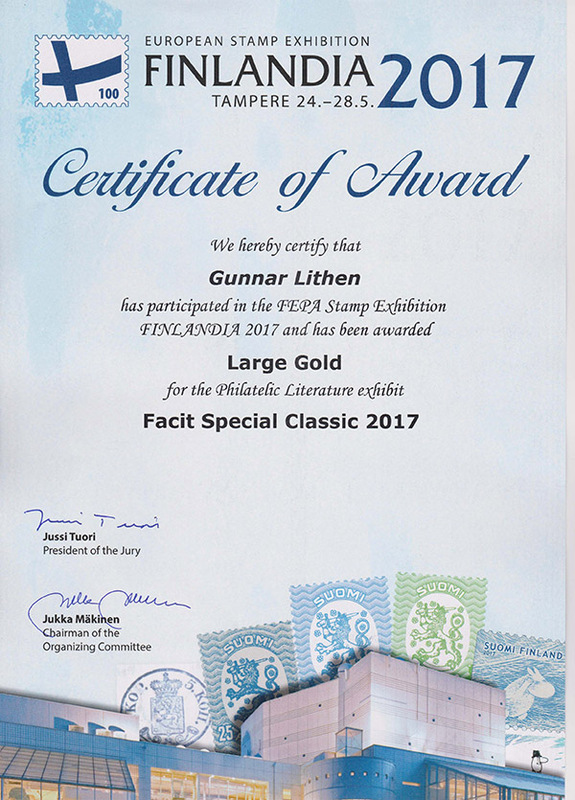 For the first time ever, a Large Gold in the literature class has been awarded to a stamp price catalogue. During the international stamp exhibition FINLANDIA 2017 in Tampere 24-28 May, FACIT Special Classic 2017 was awarded no less than 95 points and thereby a Large Gold Medal. Also FACIT Norden 2017 received very high scores and was with 93 points awarded a Gold Medal. FACIT Special Classic and FACIT Norden emerged when in 2016 chief editor Gunnar Lithén decided to divide FACIT Special into two parts. FACIT Special Classic contains all Nordic stamps up to 1951 with varieties and specialties. FACIT Norden contains all Nordic stamps from 1951 onwards with varieties, the period before 1951 is described with issue and denomination, without varieties. Both catalogues also contain current editorial material and have been highly appreciated by the collectors. What do my stamps cost? The first FACIT catalogue was issued in 1947. It has since become the standard reference and a "must-have" for collectors of Nordic philately. Armed with the right FACIT you not only have a current price catalogue with all issued stamps, but also a handbook in the art of stamp collecting. It is written by a catalogue committee of about 20 active, distinguished philatelists, each closely monitoring the market in their area of expertise. FACIT Special Classic contains all the Nordic stamps with varieties and specialties until 1951. 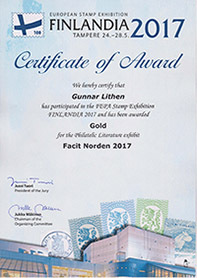 FACIT Norden contains all the Nordic stamps until the latest issue. However, only stamps from 1951 onwards are described with varieties, earlier stamps are described only with issue, denomination and price for a normal stamp. FACIT Postal is issued every five years and is focussed on Swedish town cancellations and postal history, a popular philatelic area of interest. FACIT Sverige is issued every two years and is a simpler catalogue with Swedish stamps only, including the latest local issues. The catalogue is filled with beautiful high quality colour images and the content is easy to grasp. This is the perfect catalogue for the beginner or for anybody in need of a quick valuation of their stamps.